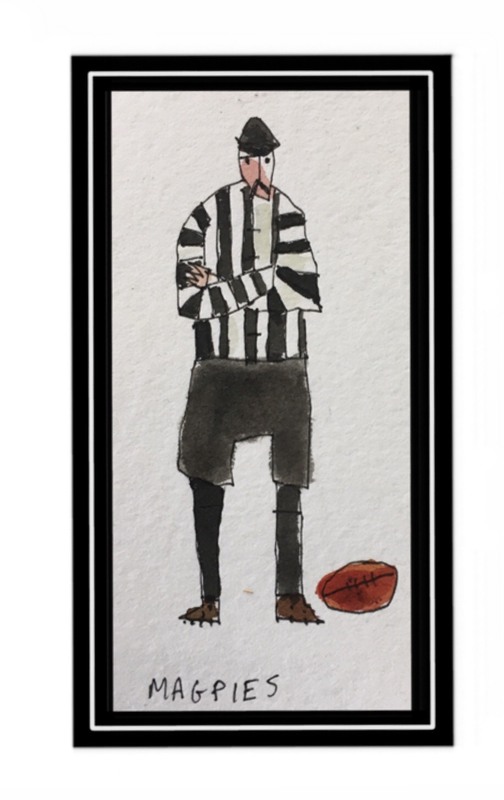 Well-known artist Nick Howson painted the cover of The Footy Almanac 2009. 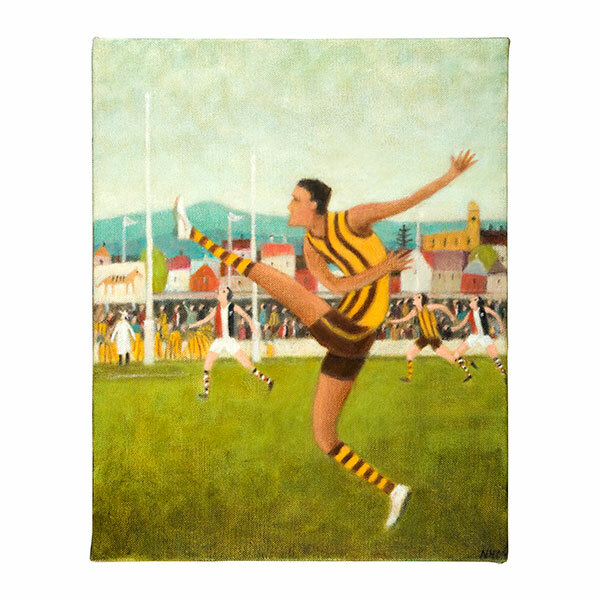 Buddy in his Hawthorn colours down in Tassie. 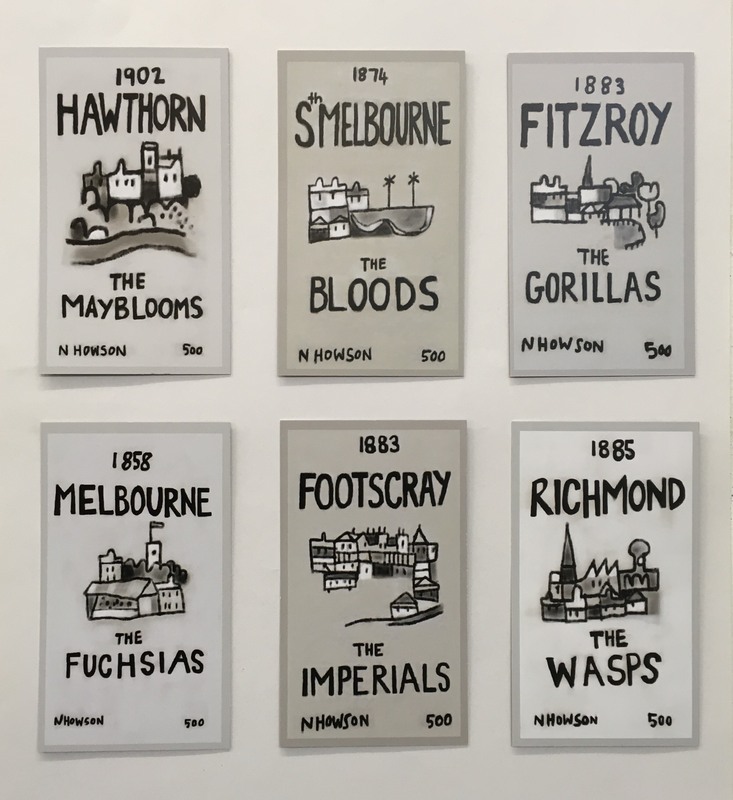 The Hawthorn information is not quite right. 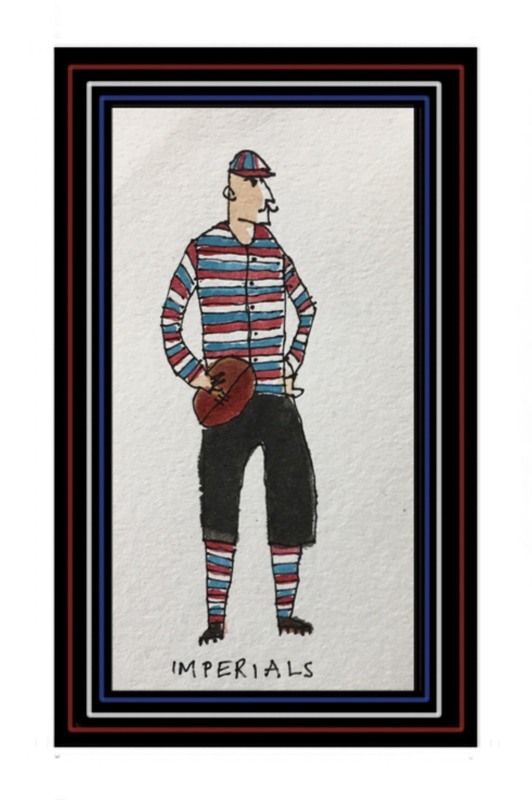 It wasn’t the president’s daughter who named the Hawks in 1925. 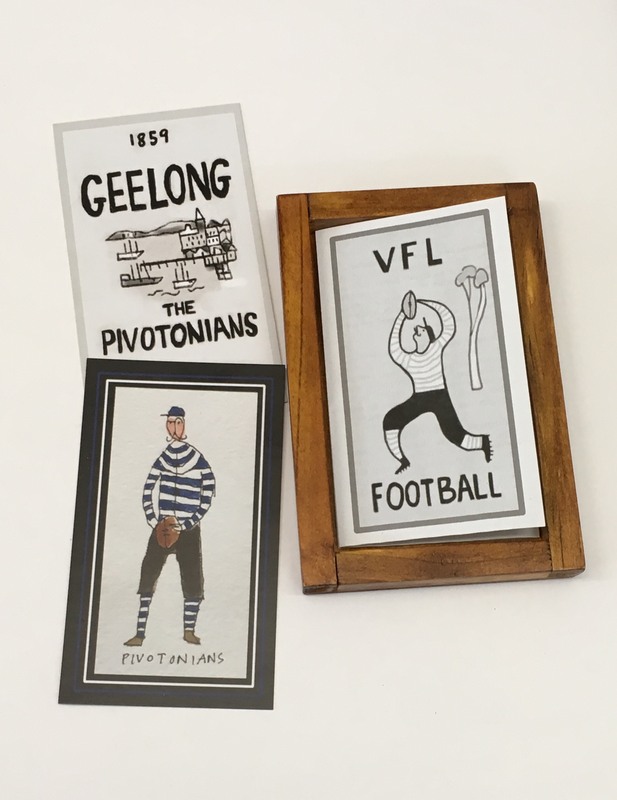 They became the Hawks in 1943 at the suggestion of Roy Cazaly’s daughter. 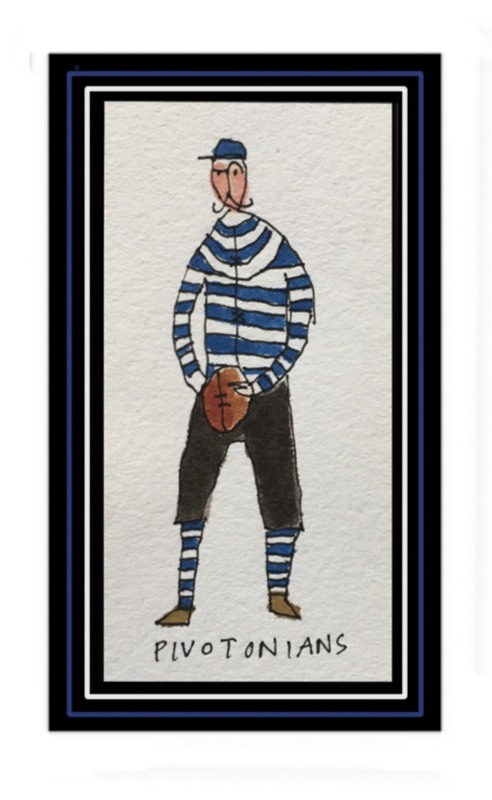 Roy coached Hawthorn 1942-43. 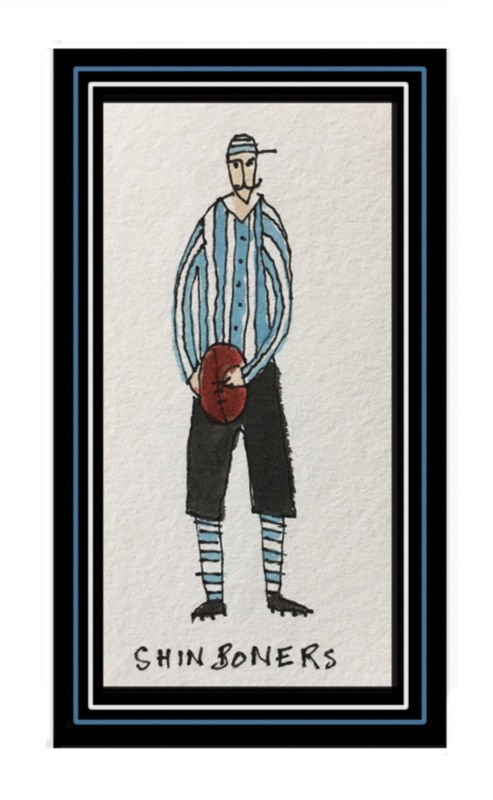 Although allowing for artistic interpretation, Hawthorn didn’t adopt the pictured guernsey until 1934, well after the nickerbocker days at the turn of the century. 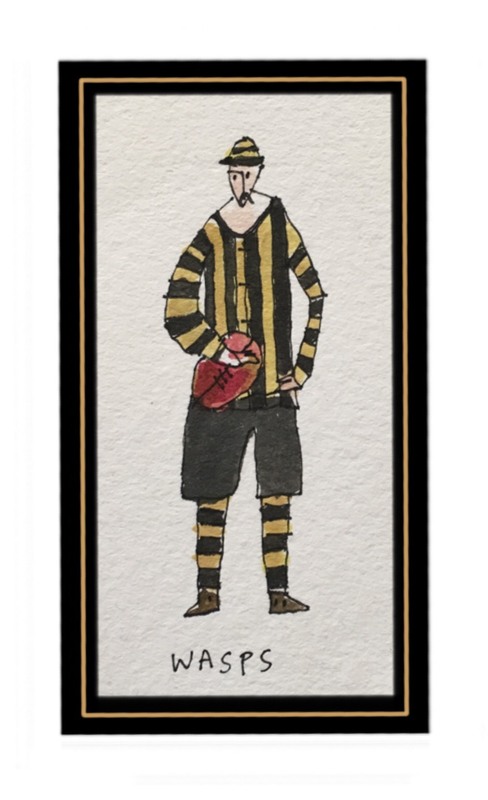 Hawthorn wore a Melbourne style jumper 1902-1905. 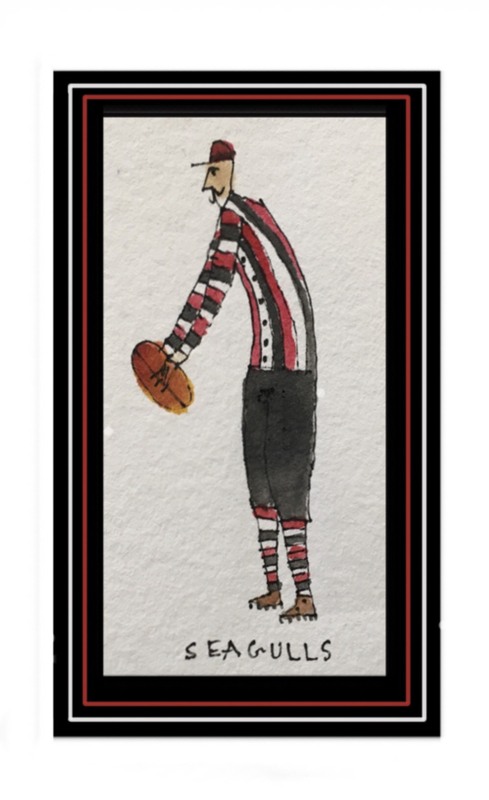 They adopted Boroondara’s colours (Essendon style) after merging in 1906. 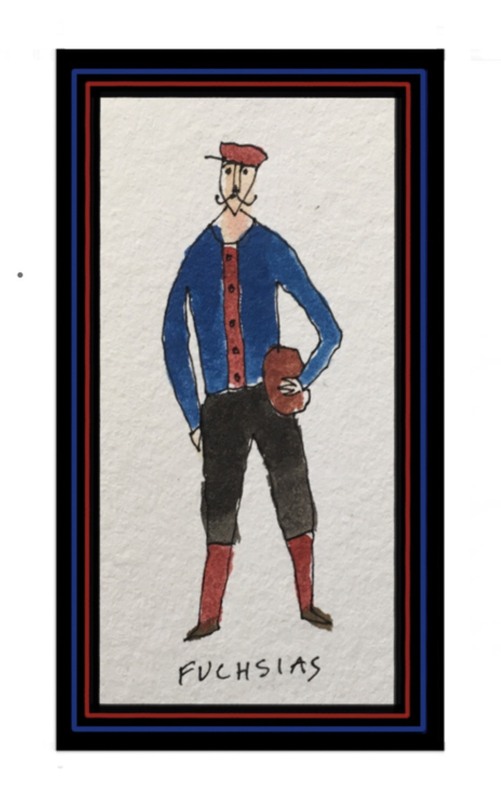 In 1912 they wore Williamstown colours but had to change in 1914 when they joined the VFA, due to the clash, which is when the brown and gold was adopted. 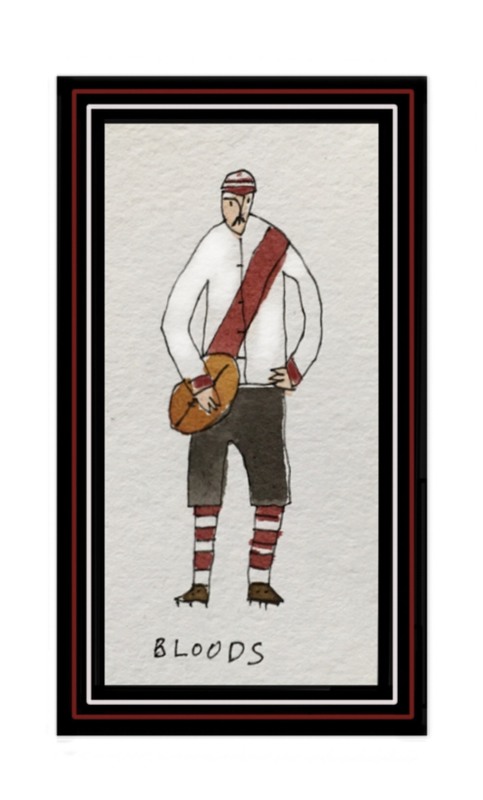 The guernsey (in several styles) had a HFC logo on it from 1914-1932 (similar to Carlton and Fitzroy). 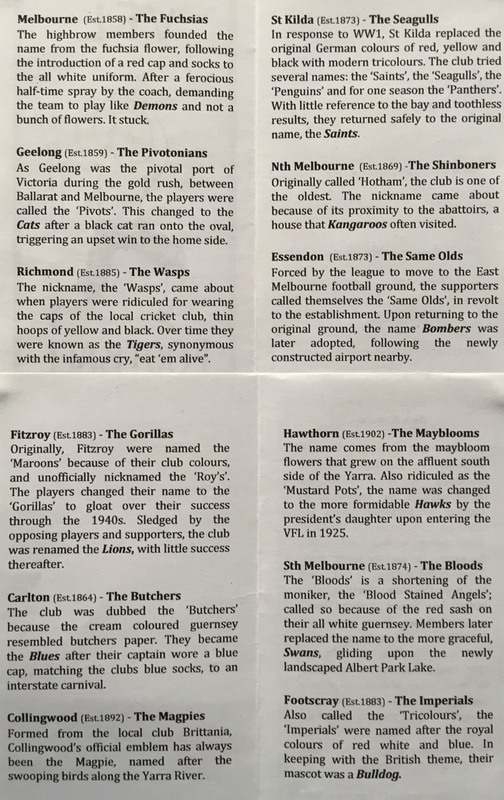 The earliest known reference to being called The Mayblooms appeared after they had joined the VFL. 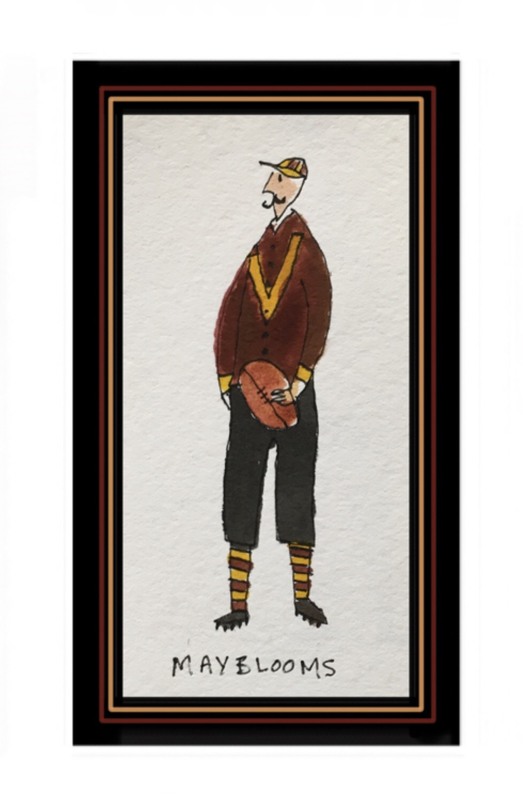 In 1933 they wore a gold guernsey with brown V which led to the Mustard Pots name. 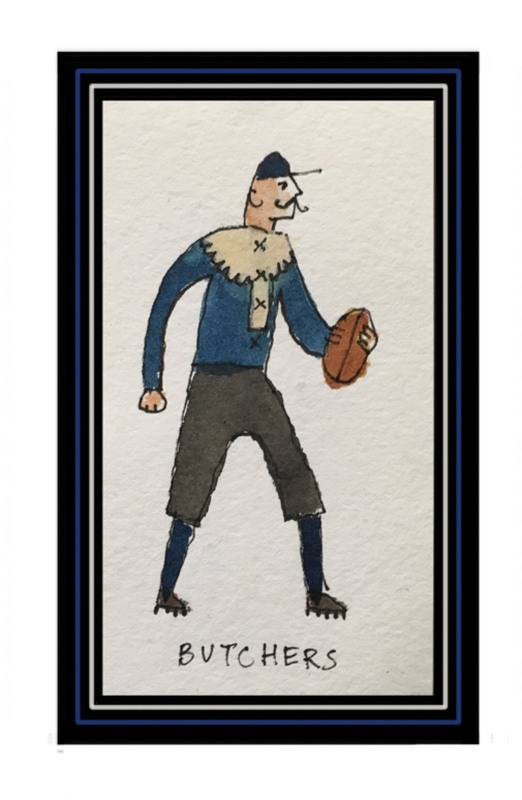 From 1934-1949 they wore the guernsey as depicted on the card. 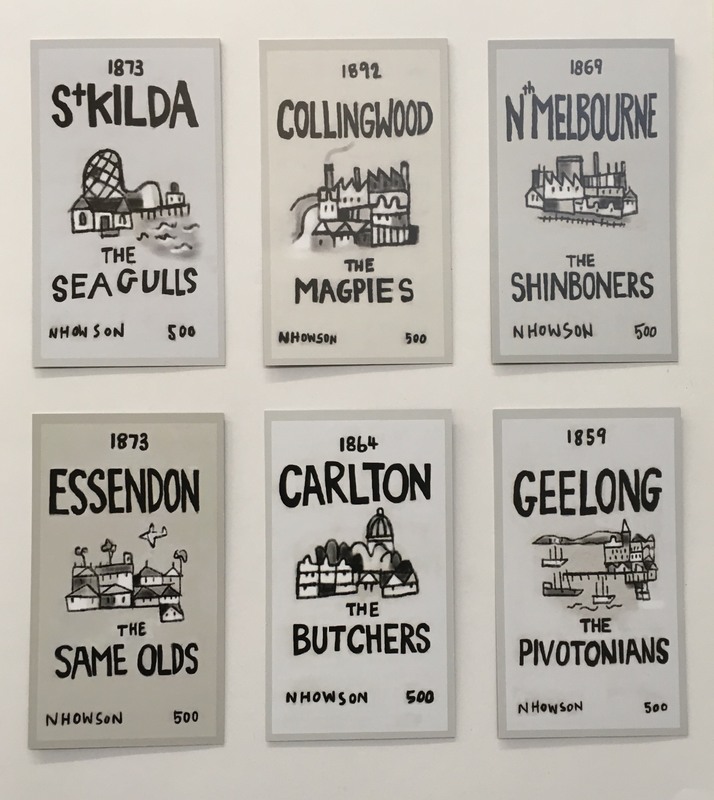 The information about South Melbourne is not quite correct also. 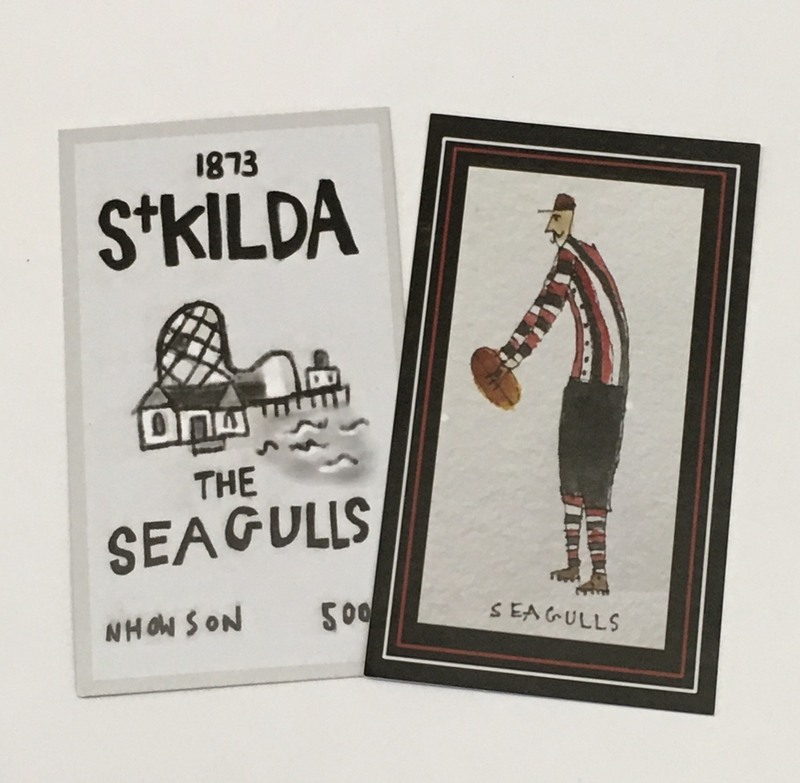 The nickname/moniker of the Swans was adopted in the 1930’s after being suggested by a Herald and Weekly Times artist in 1933, inspired by the number of Western Australians in the team (the black swan being the state emblem of Western Australia), and was formally adopted by the club before the following season, 1934.The name stuck, in part due to the club’s association with nearby Albert Park and Lake, also known for its swans (although there are no longer any non-native white swans and only black, indigenous swans in the lake). 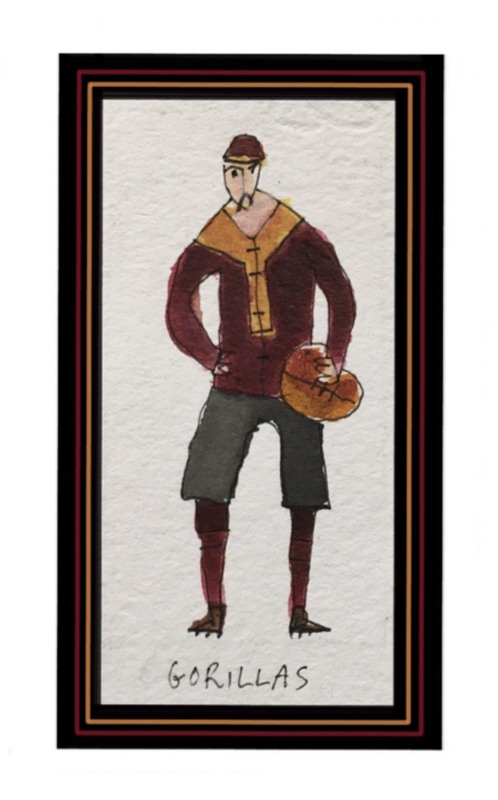 Great cards Nick. 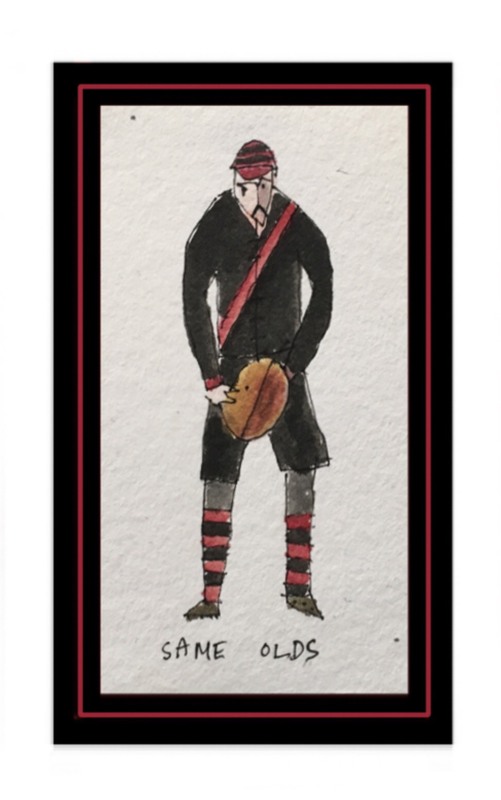 Essendon was also known as The Dons, a name I call them to this day.